I recently replaced my bedspread and didn't want to sell or donate the older one. I have a chaise lounge pad on my mattress, so it makes a "gap" between it and the wall. To fill it, I needed some pillows. 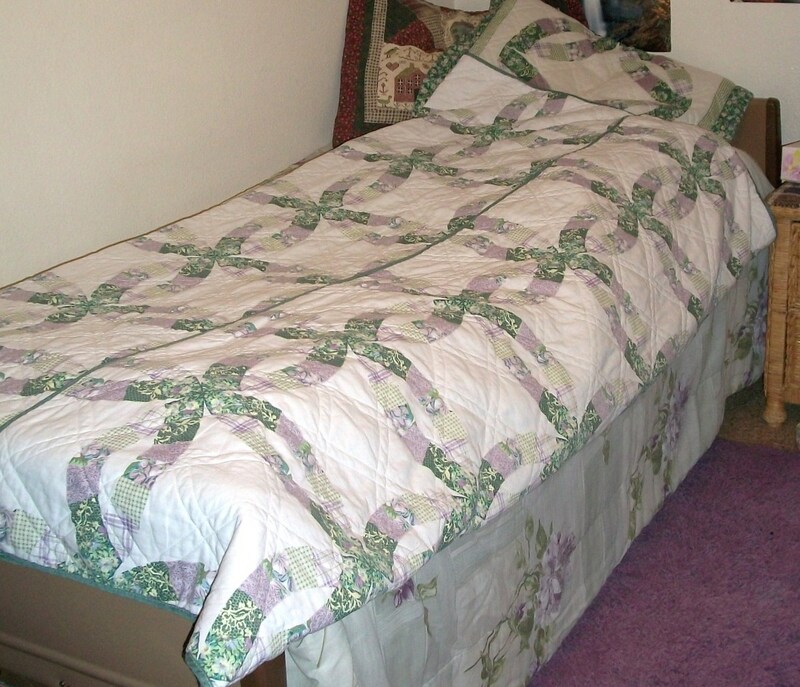 Fold the blanket or bedspread in 1/2 on the bottom and 1/4 each side on the top (closest to you). Then, simply roll it tight, straightening any wrinkles as you go. When it's rolled, tie each end with ribbon, yarn, or fabric strip. You have a bolster that goes back to a blanket for company. This also works for all the old towels you don't want any more. Roll them, cover them with pretty fabric and no one will know what is inside. LOL This is crazy! I have that exact same quilt on my bed! Same colors, same design, just in queen size. Small world! I do love the idea of using it for a bolster tho. It's a great use for it between seasons too! I'm going to have more bolters than I know what to do with! But they'll store easier this way too. I also make bolster and pillows from blankets / comforters we are not using at the moment. Use of pretty ribbons makes bolster look pretty. I like to make square "pillows", mini bolsters and shapes using same texhnique. I sometimes take a t-shirt or a pretty blouse, fold the sleeves inside and cover the "pillow" with it. Other idea is to use unused sheet for cover; lay it on the comforter & roll/ fold so the sheet will be outside. When we have company and need extra comforters, all I have to do is, take off the tshirt and unroll the comforter. By changing the outer covering, I can redecorate easily.